Today’s guest post comes from Max Gottlieb, content manager of Senior Planning, a guide to assisted living resources in Arizona. It’s no easy task caring for someone with dementia, regardless of whether you’re a professional caregiver or a family member caring for a loved one. While caregiving can be rewarding, it can also be both emotionally and physically taxing. Dementia is not a singular illness, but rather an umbrella term used to describe symptoms associated with memory loss and a decline in mental capability. In popular culture we sometimes only think of dementia in terms of forgetfulness, but there are also behavioral, psychological, and muscular effects. Symptoms of dementia and Alzheimer’s include loss of communication, reasoning skills, perception, focus, and judgment. In the beginning stages, people suffering from dementia can more or less continue living independently, but impairment eventually becomes severe enough to hinder the person’s activities of daily living (ADLs). While everyone’s circumstances are unique, below are five tips to help maintain a positive outlook in a dementia patient. Establishing a daily routine is one of the most crucial things you can do as a caregiver. 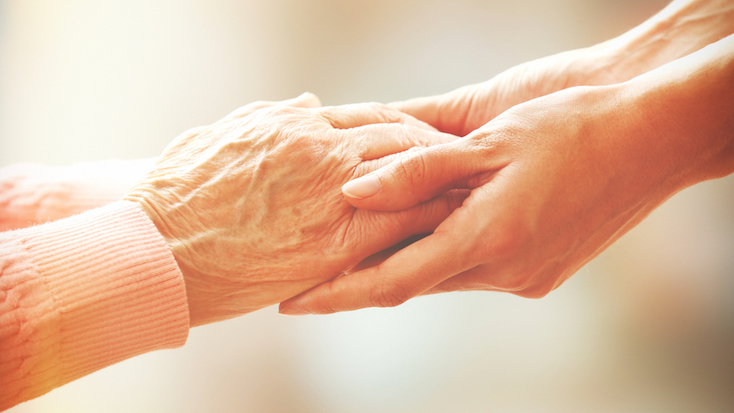 Since the person you are caring for may have a hard time focusing, a routine will lend them a sense of control, which improves their feelings of comfort and familiarity. Repetitive daily actions can prevent someone from becoming distracted and may help a person cope with short-term memory loss, which is usually one of the first things affected. Depending upon the severity of someone’s symptoms, it is important to remember that they may not be able to change their actions. Just because you repeatedly tell someone to change something does not mean they have the capability to do what you are asking. New learning, and even re-grasping once-familiar skills, can be extremely challenging and frustrating for someone with cognitive degeneration. Try to continue helping without becoming negative or exasperated. Refrain from arguing with the person you are caring for. Instead, refocus their energy when they become irritated or upset. For example, if they say they need to get home to watch a program on TV, rather than try to convince them they are home, ask which program they’d like to watch. Refocusing energy is a useful technique to move someone along, preventing them from remaining fixated on something that causes them stress. Similar to a person’s actions, the person you are caring for may have no control over their behavior. If they are behaving negatively, it is usually not intentional, but caused by changes taking place in the brain. Changing their environment or even your approach may produce positive results. I’ve heard an anecdote where an ex-ballerina with dementia greatly improved her behavior and mood when caregivers put ballet posters in her room. They also played familiar ballet music, which had a calming effect. You never know what is going to work, but becoming frustrated or angry with the person is not the answer. Learn When and How to Tell a Therapeutic White Lie. White lies, or “fiblets”, are useful in many situations and are sometimes the best way for someone with dementia to cope with anxiety or depression. For example, if the individual you are caring for becomes agitated because they want to see a deceased loved one, instead of telling them that person has passed away, tell them you haven’t seen the person in a while, but when you do you will surely tell them to call. Trying to explain the truth in certain cases can be less beneficial than trying to maintain contentment and happiness. Once you find areas that create stress for you or the person you are caring for, you will be able to change plans or activities accordingly. Keeping a list of daily tasks and checking them off with the patient will help you both maintain a routine and feel a sense of completion. Remember, if one method stops working, don’t keep pushing in that direction, but adjust and move forward. Max Gottlieb is the content manager for Senior Planning. Senior Planning is a free service intended to help seniors and their families navigate through the often-complicated process of obtaining long-term care.